My 2009 project “26 Passports” will be on exhibit at Angel’s Gate Cultural Center in San Pedro, CA from February 9 – April 11, 2014. This is the first time this piece has been shown. More details below. Angels Gate Cultural Center (AGCC) is thrilled to invite you to the launch of a new round of exhibitions that continue to explore how stories within the community shape the collective consciousness in San Pedro and South Bay area. An Opening Reception for several new shows in the Galleries will be held on February 9, 2014 from 2:00pm-4:00pm. Chamber Concert at 4:15pm. This project marks the beginning of a year-long partnership with the Union. Together we will explore the story of their members and families, the history of the labor movement in San Pedro and how this impacts the community at large. Los Angeles based artist Fausto Fernandez was selected by the Joe Baker, Executive Director of Palos Verdes Art Center, to work on the project. Work has been selected that continue to explore stories relevant to the local community. The work ranges from video to sculpture and explores issues of representation, identity and personal responsibility. Visitors will be able to tell their own story through interactive art stations in the gallery. COMMUNITY GALLERY: Symbiosis – Karena Massengill with students from Cabrillo High School in Long Beach. San Pedro based artist Karena Massengill will be showing work alongside her students work from Cabrillo High School in Long Beach, CA. The work represents the creative conversation that emerges between artist-teachers and students. 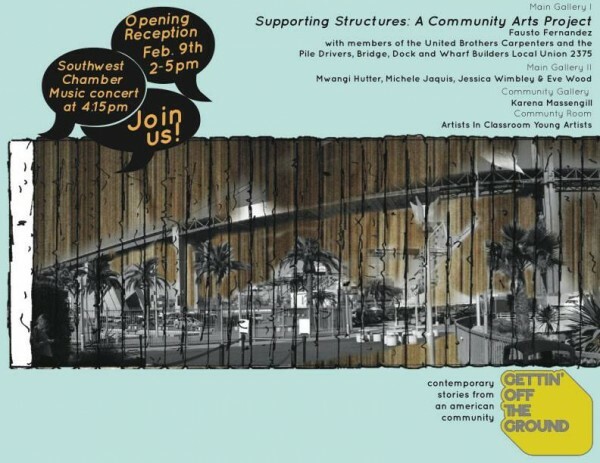 COMMUNITY ROOM: Artist-In-Classroom will showcase young artists from South Bay schools. Following the reception, join Grammy Award-winning Southwest Chamber Music in Building H for a one-hour program featuring violinist Shalini Vijayan playing pieces from J.S.Bach, Kurt Rohde, Lera Auerbach, and Hyo-shin Na, and talking about classical and contemporary music. This program is part of the Music Unwrapped series of free community concerts. These informal and interactive performances are designed to break down the barriers between musicians and audiences of all ages. Angels Gate Cultural Center galleries are open to the public Monday through Friday from 11 a.m. to 5 p.m., and on the second Saturday of the month from 12 – 5pm. Admission is always free.